Today I’ll be telling you all about my journey to come here. It certainly wasn’t easy so I am writing this in the hope that if you read it, you’ll know what I did wrong and be able to avoid it so that your arrival can be as smooth as possible. Let me first tell you what happened with me. I set out from Damascus to Beirut with my parents (there are no flights to Europe from Syria these days) who then dropped me off at the airport. I had booked a flight with a stop in Istanbul (I recommend getting a direct flight if you can, it’s much better and faster). I arrived in the UK at around 9:15 pm so I just missed the International welcome (more on that below) which meant I had to make my way to university alone. The university’s ‘Pre-departure Guide’ had instructions on how to get to university by public transport (I didn’t want to take a taxi because my friends were waiting for me at Guildford train station) so I thought I’d follow these and be fine. So I took the underground into London and got off at London Waterloo, which is the station from which trains to Guildford run. Unfortunately I arrived just past midnight which meant the last train to Guildford had left. I was advised to take the train to Woking (the closest town to Guildford) and then continue the journey in a taxi. So I took the train, arrived in Woking, and got a taxi from the train station entrance (you will always find taxis at train stations). I told him to take me to Guildford train station, rather than the university because my friends were supposed to be waiting there. It was past 1 am at this point, but my phone was dead and I had no way of contacting them so I didn’t know if they were still waiting. The taxi dropped me off at the train station at about 2 am. It was quite dark and I was very tired and sleepy so I couldn’t even find my way into the station. I looked around for a bit, concluded that my friends had left, and started trying to find the way to university. I spent nearly an hour wandering the streets with my heavy bags in tow; every time I saw a light in the distance, I would think a shop or something was open and I was saved but when I would get there, I would find the place was actually closed. It turns out most shops and offices don’t turn their lights off at night here for some reason, which is really annoying. Eventually I found some people working at a construction site who told me the university was just a few minutes’ walk away. I got to the campus in the end, but it’s a big campus and I was supposed to be collecting my key from a specific building and of course I had no idea where it was. I ended up wandering around a little more until, luckily, security found me and took me to their office, where they gave me my key and took me to my room. And that was my very exciting journey. I can happily say that since that time, the university has put in a lot more maps and signs around campus so finding the place you want to go to when you still don’t know your way around is now much easier. Now to tell you what to do to avoid ending up in a situation similar to mine. First off, what to bring with you. Remember that power sockets in the UK are different from the ones we have in the Middle East so if you can find one, bring a UK power adaptor with you. Alternatively, just carry a portable charger. One thing you really don’t want when going to a new country (probably alone) is your phone dying and having no means of communication with the world. Your parents will probably panic (as mine spectacularly did) if they don’t hear from you an hour or two after your plane was supposed to land and have no means of getting in touch. My most important piece of advice for you is this: arrive during the day. You really do not want to be arriving in the dead of night. Unlike most places in the Middle East, Europe in general, and small towns like Guildford specifically, sort of shut down at night. You’ll barely find any people in the street. Moreover, during the day public transport operates more frequently so using it will be faster and easier. And most importantly, if you choose to arrive during the university’s main moving-in weekend, during the day there will be Fresher’s Angels around who will tell you where to go and what to do when you get to university. They’ll also carry your stuff to your new room for you which is a big plus. In my time, as an international student coming to start your first year, you could sign up for an international welcome where the International Student Support office here at the university would come and pick you up from the airport on specific days and at specific times. I am pretty sure that scheme is still running; I would really recommend signing up for it if you don’t want to wait until moving-in weekend to arrive; you get to see friendly faces as soon as you get here and you get a free ride straight to university without having to pay nearly £50 for a taxi or having to go through the effort of a segmented journey on public transport, which will be confusing the first time you use it. Bear in mind that this scheme operates only up to 9 pm on the days it runs. To be extra safe, you could carry a map of university with you (I think you can print one from the university website) and also perhaps a map of the route from the train station or bus station to university (Google Maps could be a good way of getting that). In summary, try your best to arrive during the day, preferably avoid public transport just to make things easier for yourself, and if you can, arrive either during moving-in weekend or when the International welcome is operating. That’s all from me today. 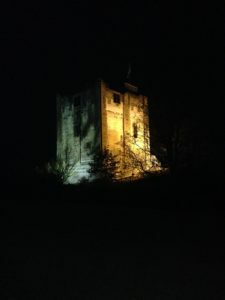 Here is a picture of Guildford castle during the night, just to show you how dark it gets here. You would think it was in the middle of nowhere judging by how dark the surroundings are, but it’s actually in the heart of Guildford. Just to show you that arriving during the day is a lot ‘clearer’, if nothing else.